It's a small world, but I wouldn't want to paint it! A couple of days before I set off for Havana for the Partagas XIII centenary dinner I got a knock on the door from a Canadian acquaintance who, like me, now lives in Cowes on the Isle of Wight. "I'm flying to Havana on Thursday for a few days of yacht surveying and a bit of R 'n' R," he said, "and thought I'd pick your brains on Cuba and which cigars I should buy." Turned out we were booked on the same Virgin Atlantic flight. 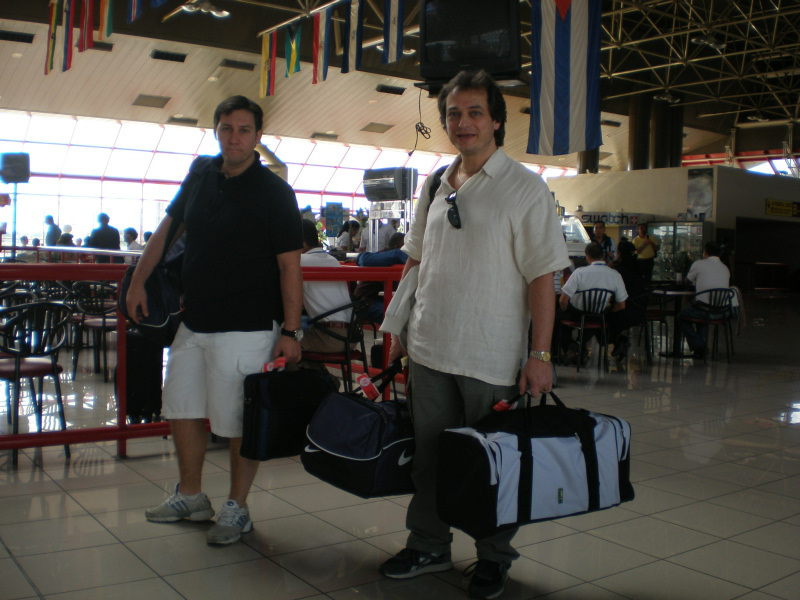 I suggested we meet up at Gatwick where I would introduce him to Mitchell Orchant, who would also be en route to Cuba and who could answer any questions about Havanas that anyone is ever likely to come up with. 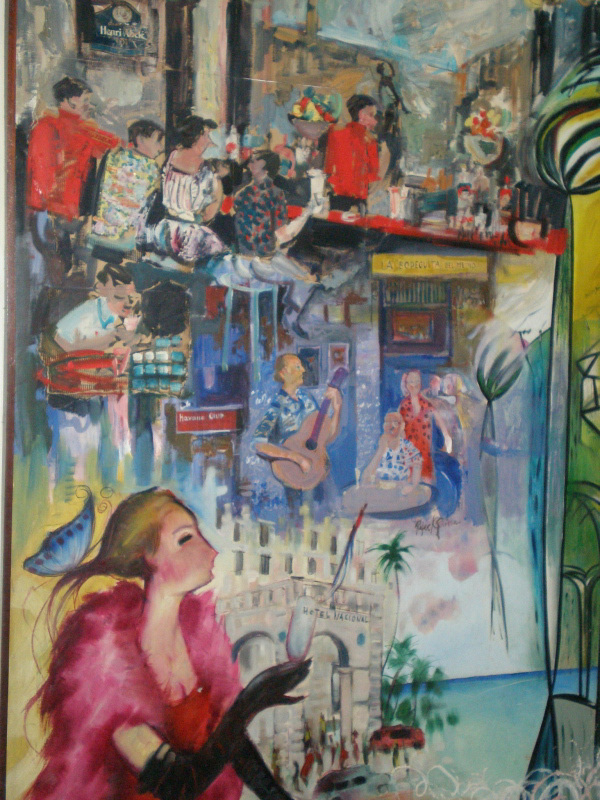 A few days earlier I'd had a call from Mitch asking if I was attending the Partagas dinner and if I fancied wandering around Havana with him in search of Cuban cigar-related antiques, and maybe sharing a Daiquiri or three at Ernest Hemingway's favourite hangout, the El Floridita bar/restaurant. 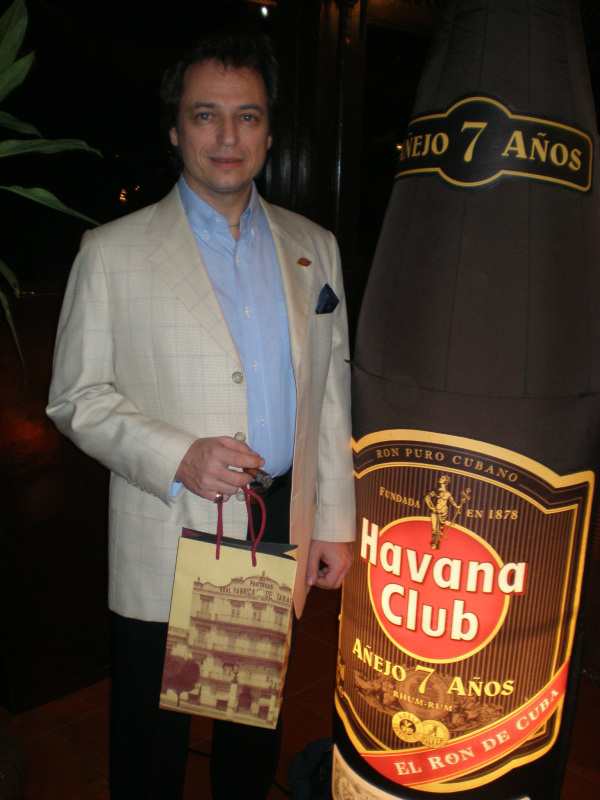 We would be joined by one of his old friends, Brian Ebbesen from Elliston Fine Wines Ltd in London. Ebbesen was Christie's South Kensington's former cigars and wine expert who'd introduced vintage premium Havana cigar auctions to the UK, in 1999. I'd already interviewed Brian a few years ago and, hey ho, it sounded like the makings of an interesting trip. Anyway, we arrived at Gatwick on a cold and wintry morning and went through the usual glad-handing and pass-the-lighter-do-you-fancy-a-drink-and-what's-that-you're-smoking ritual and zoomed off to Cuba, leaving the UK's stormy weather behind for a balmy 80 degrees Fahrenheit of sunshine and nicotine-friendly frolics. In case you're wondering, the Canadian was a novice smoker so Mitch suggested he invest in a box of Montecristo Petit Tubos. You can't go wrong with a Monte. It was an auspicious day, for as we lifted off the tarmac the UK's specialist cigar merchants were all on tenterhooks, to put it mildly. 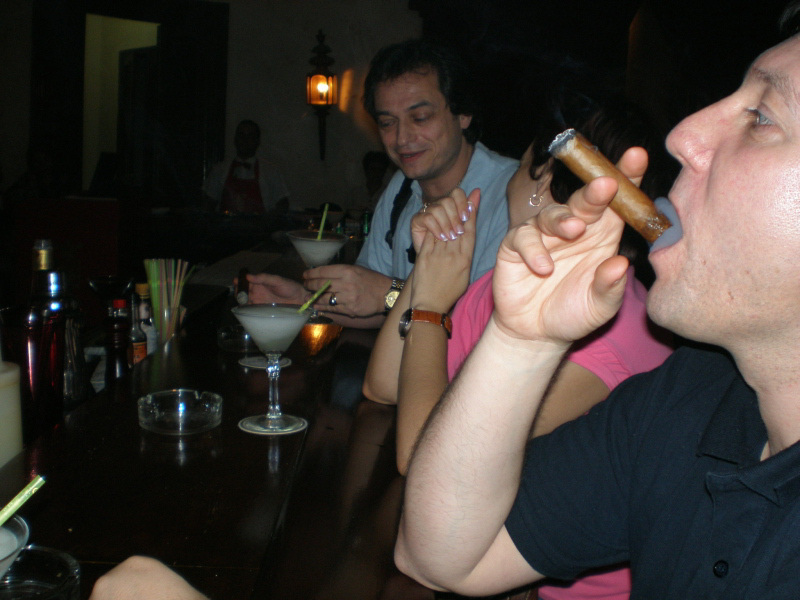 By the time we arrived in Havana, the European Court had ruled that the UK's cigar lovers cannot import alcohol and tobacco products from other EU members, paying only the duty in the country of origin. Just as well really for it would have knocked a huge hole in Britain's Chancellor of the Exchequer Gordon Brown's budget. No doubt he would have been forced (yeah, sure, with a non-smoking gun to his head) to raise taxes elsewhere - such as on baby food and breathing pure air - to plug it, instead of cutting spending. 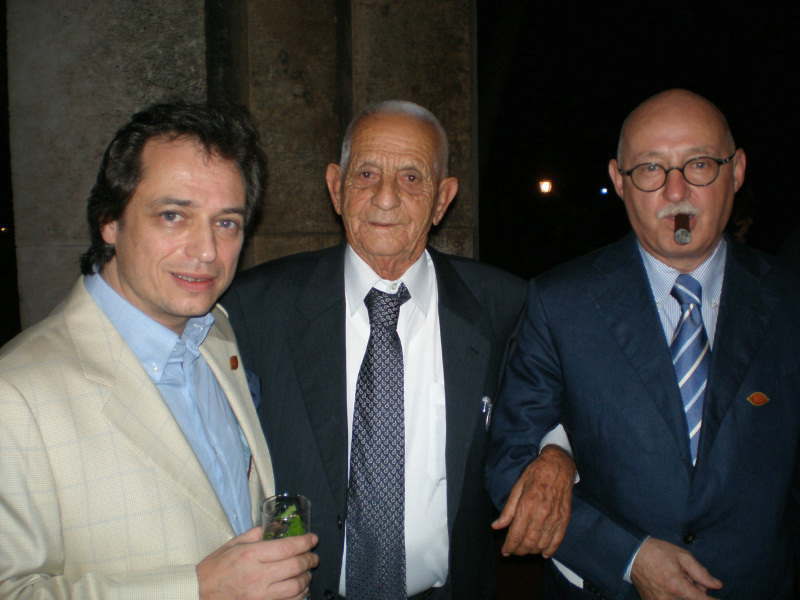 Not that this bothered Mr. Orchant, who had only a few weeks earlier opened his first Casa del Habano in Hamburg in partnership with his old friend, Christoph Wolters, former manager of the Casa del Habano in Cologne. 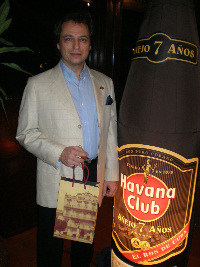 Cologne's loss was Hamburg's gain and has now turned Mitchell Orchant from one of the UK's most successful cigar retailers (he owns four specialist tobacco shops, in Liverpool, Glasgow, Edinburgh and Chester, and was the Silver Chaveta UK Specialist in Havanas Award winner for 2005) into an international force to be reckoned with. During the Virgin Atlantic flight to Havana, I watched several newly released films, some of which have managed to get on the American Medical Association Alliance's latest top ten hate list of movies that glamorize smoking. Virgin's excellent cigar-friendly selection included The Ant Bully, Material Girls, Pirates of the Caribbean 2 and my favourite, Superman Returns, which features Kevin Spacey as a particularly nasty Lex Luthor - you can tell how evil he is by the size of the huge gob-stopper of a cigar that he sticks in his mouth after he stabs Superman with a Kryptonite knife. As we were flying in something that resembled a cigar tube with wings the in-flight entertainment seemed very appropriate. It would have been even better if they'd installed a decent ventilation system and allowed some of us to smoke during the flight. It would have been even better if they'd installed a decent ventilation system and allowed some of us to smoke during the flight. Anyway, we arrived safely, albeit two hours' late, and checked into our rooms at the Hotel Nacional de Cuba in Havana. 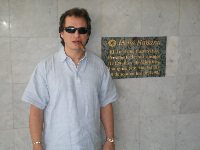 Mitch had requested I write something for his website, for which he would keep me supplied with cigars, food and all the booze I could drink during the trip. "Maybe it would have worked out cheaper if you had given me a large wad of Cuban Pesos," I told him, while we tucked into our first bottle of Santiago rum and our first Partagas Churchill de Luxe. To be honest, I would have been happy to write something for Mitch, gratis, for I enjoy his company, but please don't tell him or a huge bill will be in the post. 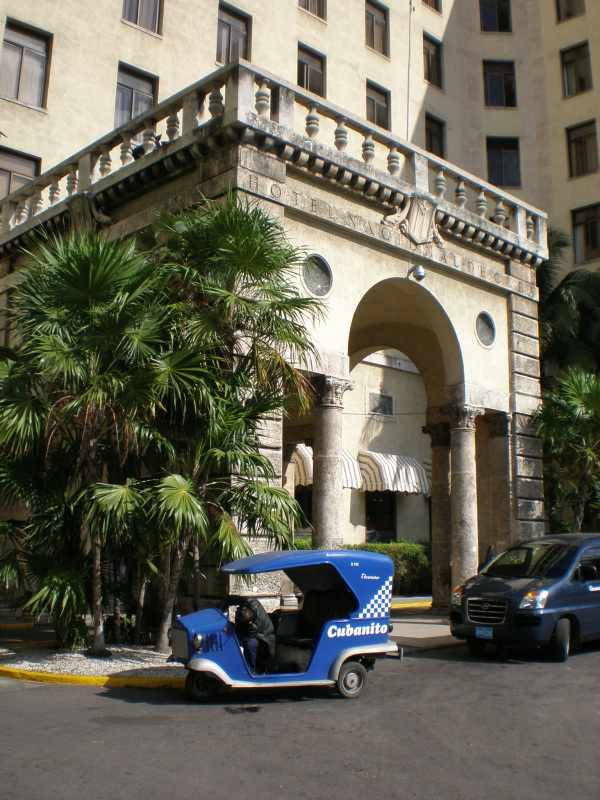 The great thing about wandering around Havana with Mitchell Orchant is that you get to meet a lot of interesting people, including Nobuhiro Nakamura from Japan, Angelo, Massimo, and Minetti the driver from Italy. 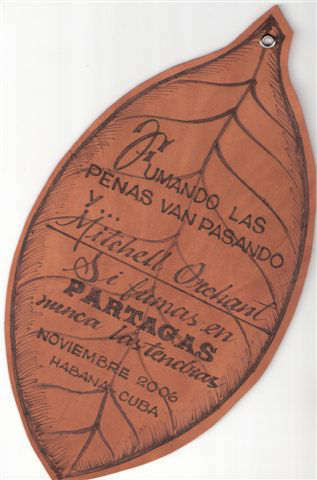 In the Partagas factory's VIP room, Mitch was smothered by the attention of the new chief roller (a role she had taken over three months' earlier), Ana Teresa. 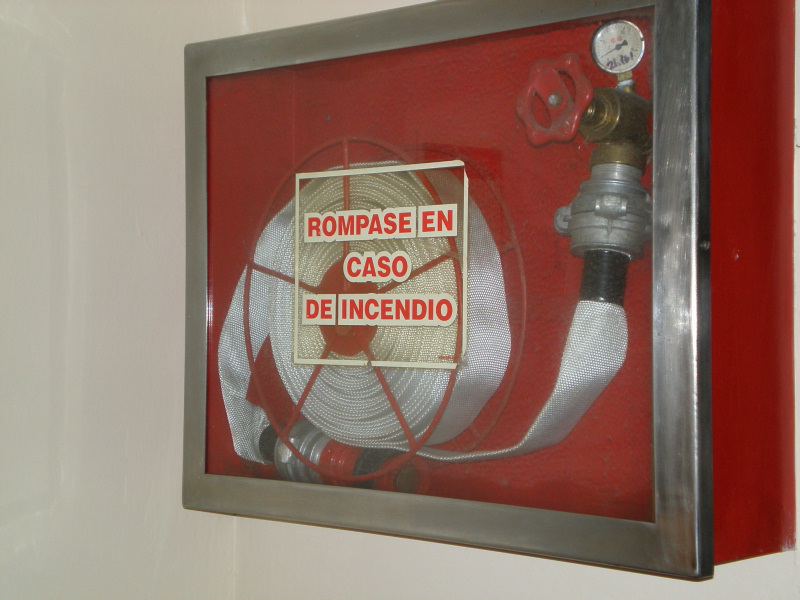 Sign in Hotel Nacional - not far from Mitch's room! It seemed the perfect moment to try one of the Partagas XIII Anniversario cigars I had been given at the Partagas factory the night before. 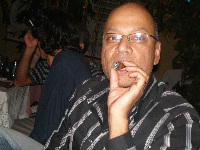 Full-bodied and elegant, this dark, mottled, luxurious Havana burnt well and provided a smooth smoke and wonderful aroma. 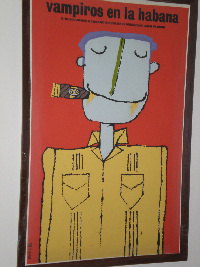 It was perhaps a bit too fresh - like many of the cigars I tried during my few days in Havana - but it was a pleasant way to wake up on what would have been a slow Friday morning, back home. Dawn eventually broke and the day started as it meant to continue: very bright, warm and sunny. According to CNN there were blizzards back home. Mitch and Brian eventually fell out of bed and we all fuelled up on a very relaxed Cuban breakfast on the executive (6th) floor of the Nacional. Earlier, I had checked out the breakfast in the main dining room on the ground floor and as it included cold brussels sprouts and frankfurters, decided to give it a miss and try upstairs. 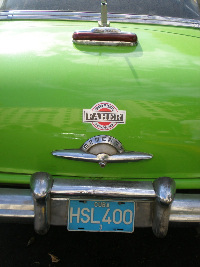 Then we loaded the portable humidors and pocket cigar cases, sharpened our cutters, and with several gas lighters primed for the day ahead, leapt into a Cuban taxi to head out for a series of visits to a couple of antiques dealers and some of Havana's finest cigar shops. En route, we reminisced how incredibly easy it had been to get through HM Customs at Gatwick Airport. Mitch had been stopped, briefly, for not placing his favourite aftershave inside the requisite see-through plastic bag inside his hand luggage, but the Customs officials didn't seem remotely bothered by the large lethal-looking cigar cutter he was also carrying, or the dual-flame cigar lighter, which was powerful enough to melt the wings off a Learjet. 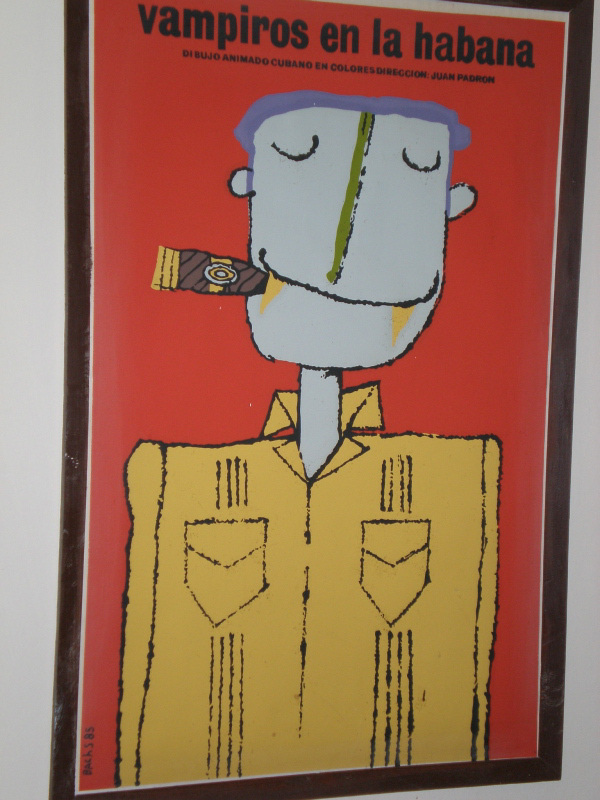 Our first stop was a house in a down-at-heel Havana suburb, where a young attractive Cuban woman tried to sell Mitch copies of several recent photographs of the ailing Fidel Castro, and other Cuban political celebrities, at $150 a pop. 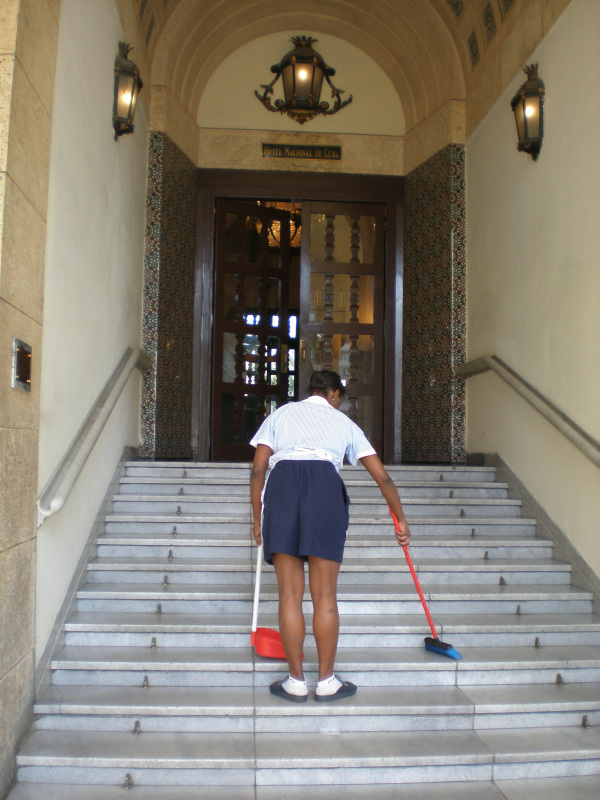 She assured Mitch that only ten copies of each photograph would be printed, as authorised by the Cuban photographer who took them and on whose behalf she was acting as a go-between. Mitch assured her he wasn't born yesterday and we left her to try and scam some other non-Cuban sucker. 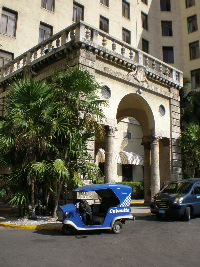 As lunchtime was fast approaching, the driver was requested to take us to Le Casa del Tabaco La Cecilia, from which Mitch wished to stock up on some seriously fine cigars for the remainder of the day. 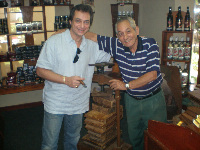 They were all personally rolled by one of the Gods of Cuban rollers - Rudolpho Leiba, who had once rolled cigars for Winston Churchill, and is now over 70 and still very active. Afterwards, over a lunch of pasta at the restaurant in the opposite side of the open air nightclub which houses La Cecilia, I got talking with Mitch and Brian. "This is fun," I told them, "but can you remind me why you here?" was wafting out of a nearby restaurant. JL: How many times have you been to Cuba, Mitch? Mitch: 30. I started in 1997. JL: What are the biggest changes you've seen, over the years? 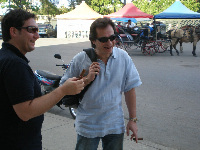 Mitch: I've seen many changes and generally they are for the better: better cigars, better quality, better food - marginally, better flight times and better flights. And the weather's always been lovely. JL: When did you get into Cuban antiques? 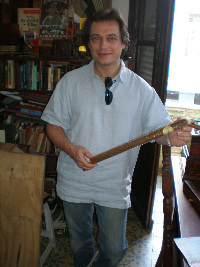 Mitch: On my first trip, when I started buying photographs of Fidel and Che. I think there will always be a value to original photographs of Che; he's an icon of our times. 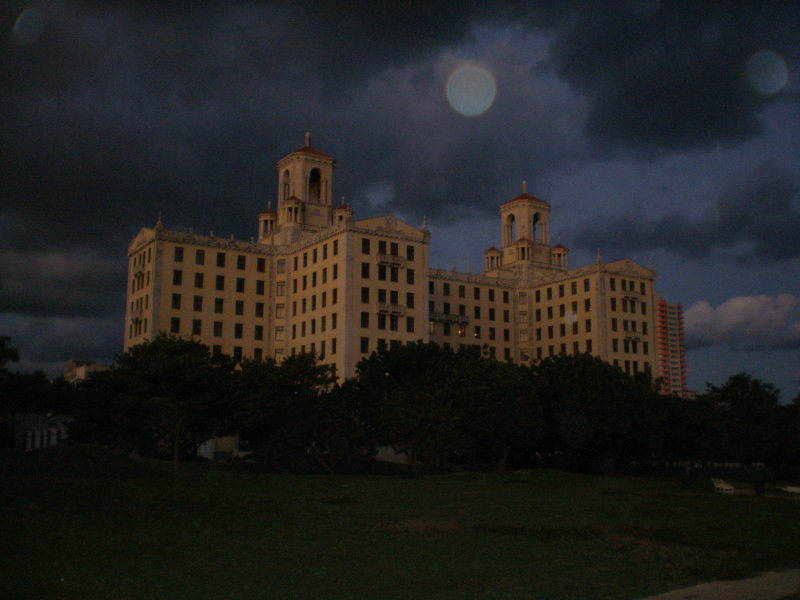 I'm hoping that the same will be true for Fidel. JL: I'm told you're not very good at parting with your Cuban collection. 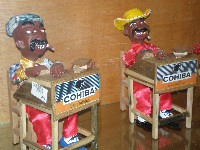 Mitch: It's probably one of the biggest collections of Cuban smoking-related antiques in Europe. JL: What's the most unusual or interesting item? 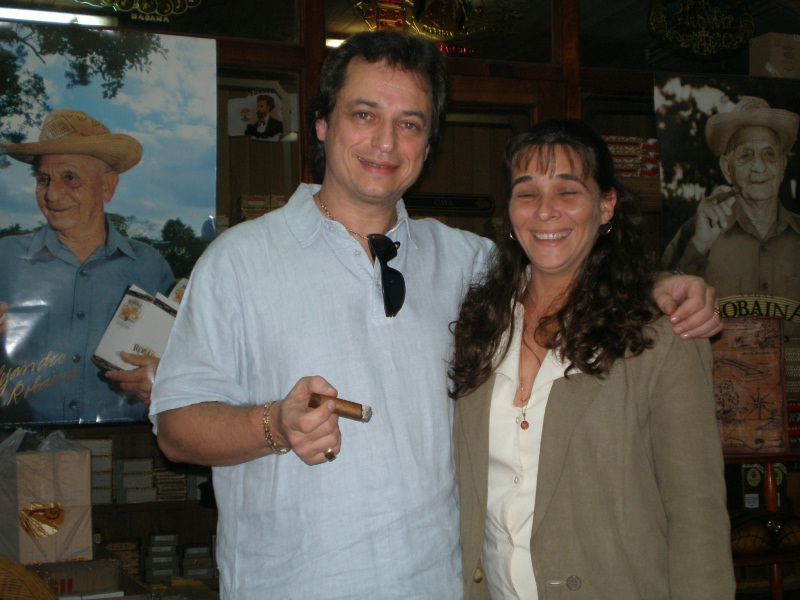 Mitch: There are so many - particularly the humidors that have inscriptions of famous people from pre-Castro times. 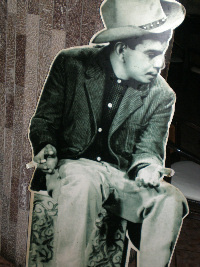 For example, we have boxes dedicated to Batista and Menocal, among other famous Cubans....even the head of Cuban Customs from 1948! JL: What are the most popular items in your collection? Mitch: Ceramic jars - Ramon Allones brown jars, Partagas brown jars, and the very rare Partagas blue jars, of which only a thousand were made. 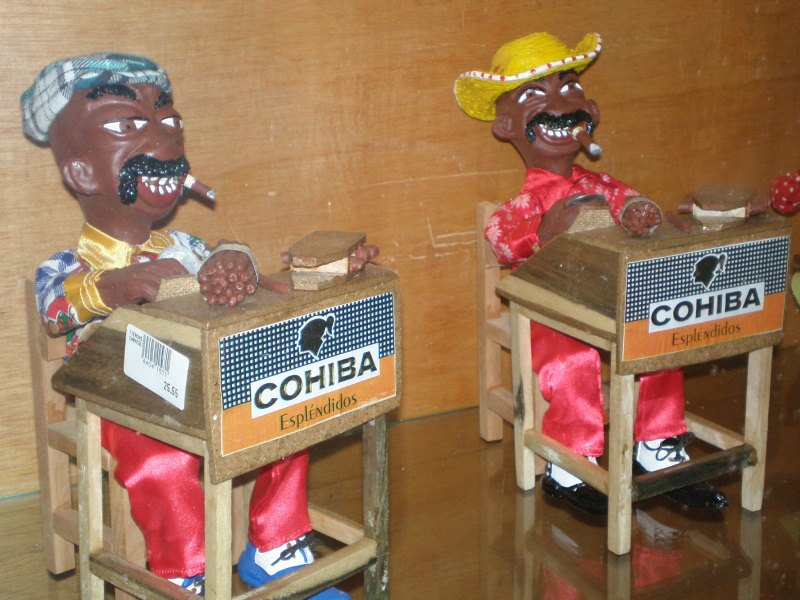 The jars actually weren't made in Cuba, they were made in Spain. JL: You must have made some interesting and useful contacts over the years. Mitch: I have very good contacts, particularly in Havana, including collectors and dealers. But they prefer to remain discreet and so do I in my dealings with them. 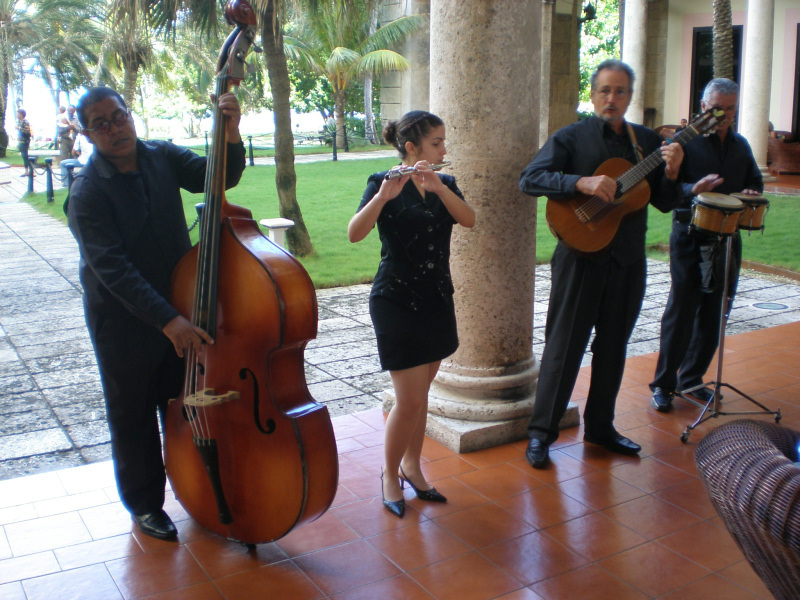 That said, everything is done on a strictly legal and official basis, and all the right forms and export licences etc are processed before the antiques are taken out of Cuba. And it's all got provenance. 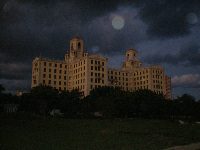 JL: While you've been wandering around Cuba with me looking for antiques you have been glued to your XD-A. In fact, over breakfast this morning you were trying to download over 1,100 emails from your various businesses in the UK and Germany. How many emails do you get on that machine, on average? JL: But you're not really that far away, are you? Just as far as that XD-A, which seems to be permanently installed in your pocket. And you've been keeping constant track of your business. Mitch: I watch everything that's going on, in London, Liverpool, Chester, Glasgow, Edinburgh and Hamburg. JL: The Casa del Habano in Hamburg must be an interesting one to watch. Mitch: It certainly is. My colleague, Christoph Wolters, opened up about two weeks' ago (early November 2006) and he's running the retail side of the business. 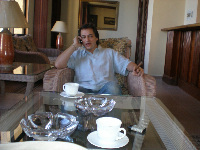 I'm in charge of the Internet commerce side of the business, and the marketing and PR. And, so far, we have got many, many Internet orders coming in, far more than we expected. In fact, our first month's sales are on target to be 100 per cent above our original projected target. JL: Where did the idea of the Casa come from? 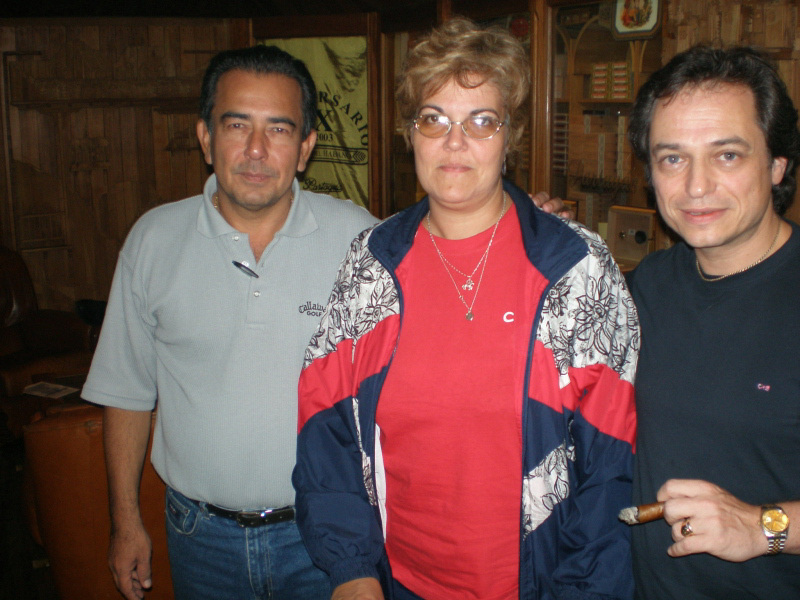 Mitch: C.Gars Ltd wanted a Casa del Habano in London for some time now but the economics of it didn't stack up for us in the UK. So it was then a question of finding an alternative 'right' site. I was invited into the partnership by Christoph Wolters to provide back-office e-commerce facilities. We don't think any of the other Casas around the world have a particularly strong Internet presence in order to do that. So we targeted Hamburg as a very good, affluent location, particularly as it is the second most affluent city in Europe, after London. 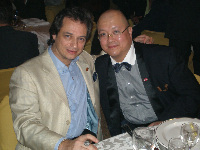 Hamburg is an ideal location for our joint business. The Hamburg Casa is not only in a great upmarket location it also features, among other things, a very big cigar lounge and a 3.8 metres high, glass, walk-in humidor. 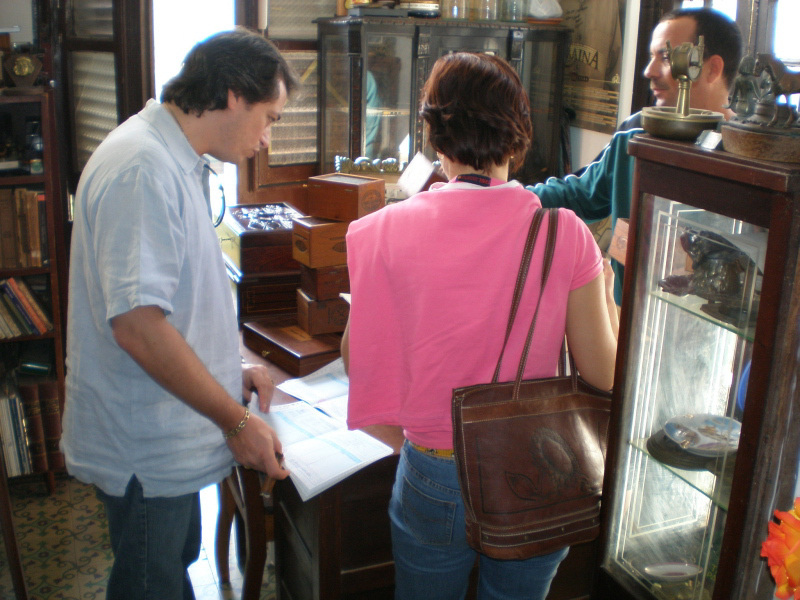 It's also full of Cuban antiques. JL: You've finally relented and let some of them go? JL: So suddenly you're international. Are you hoping to expand, with more Casas? Mitch: We do plan to have more Casas and intend to open more Orchant/Wolters cigars shops in Europe over the next five years, yes. JL: When did you meet Christoph? 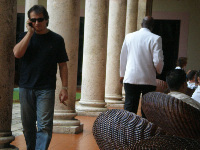 Mitch: I met him about 6-7 years ago in Havana and we became very good friends. 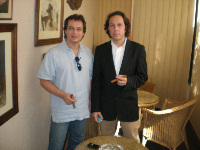 He used to be the manager of the Casa del Habano in Cologne and is a very well known cigar merchant, not just in Germany. Mitch: I started buying cigars in Cuba about ten years ago but they're mainly for my own use, and not for sale. C.Gars Ltd deals exclusively with Hunters & Frankau back in the UK and when I'm over here I buy my official Customs allowance of cigars - usually something that's difficult to get back in the UK - and take them back home to smoke. 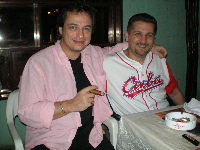 Mitch: I met Brian through Christie's cigar auction and we've remained very good friends for years. 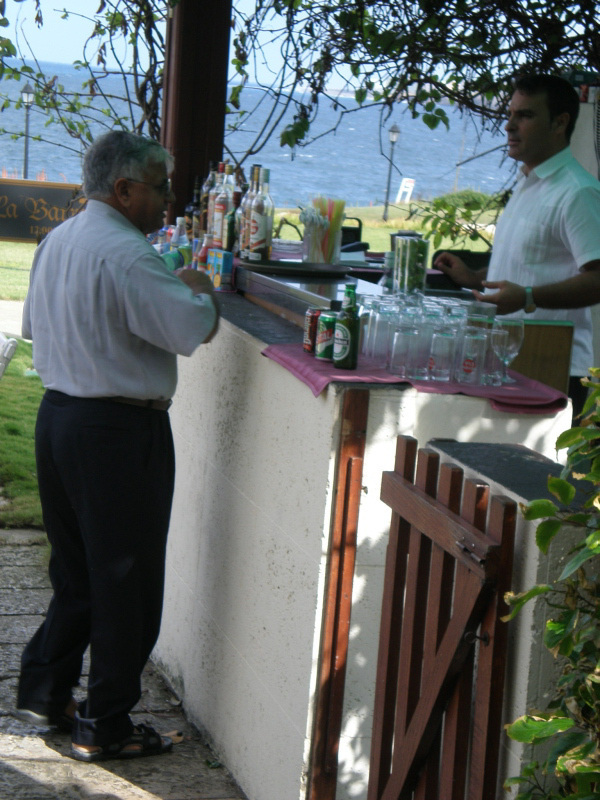 We enjoy meeting up fairly regularly for wine tastings. 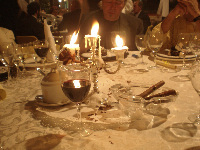 And we always try to match up the wines with unusual Havana cigars, such as pre-embargo Havanas, Davidoffs and Dunhills - and generally have a very good time. JL: So what makes you unique compared with the other cigar retailers in the UK? day. It's quite unique. We're trying to give an all-encompassing personal service internationally. JL: How will the forthcoming UK smoking ban affect your business? Mitch: It will affect the socialising that we do because we are usually out 3-4 nights a week to a nice cigar-friendly restaurant, bar or cigar divan in London and obviously that's all going to disappear. And that's a terrible shame for the overall cigar-friendly scene here in London and the rest of the UK. In terms of how it will affect business, we don't expect it to affect our business at all because domestically the UK market customers generally in their homes anyway. Our specialist tobacco shops in Scotland have seen no overall change to cigar sales since Scotland's outright ban. JL: I've heard that in a lot of places where smoking has been banned that the sales of cigars and the number of smokers hasn't actually gone down. 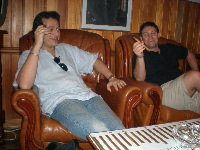 Mitch: Yes, we understand that our friends in the Republic of Ireland have seen no change in cigar sales. JL: I've very rarely ever seen you without a cigar in your hand - how will you cope with not being able to smoke in your own office? 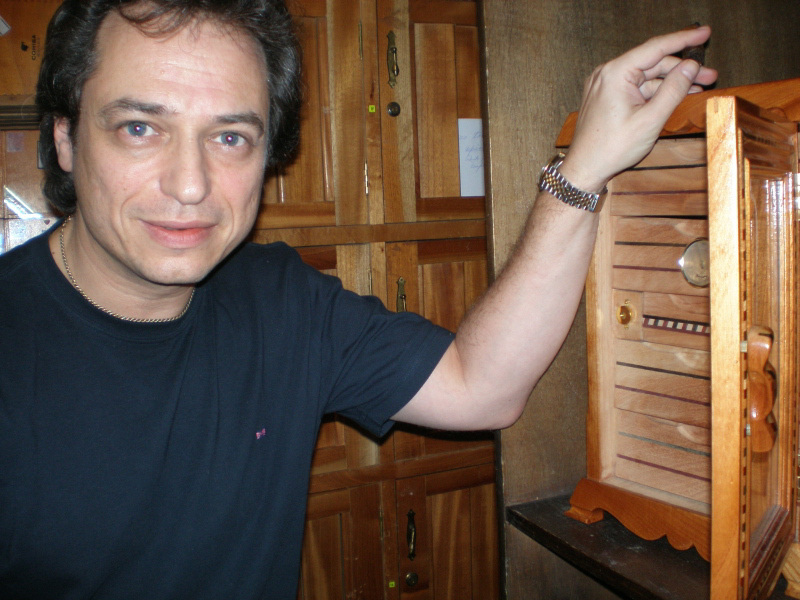 Mitch: I've built a mirror image of my office in my study in my home in North London. I've got all the mod cons of technology to enable me to work from home, where I can smoke in peace. 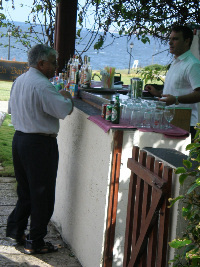 JL: You also sell fine...booze...and even more interesting, a wide selection of excellent air filters. Why aren't people buying more of these filters? Mitch: They do. The Csonka air purifier range has been our best selling range of accessories for the last eight years now. We sell absolute loads of them. JL: Do you think the interest in air purifiers will grow after the ban? Mitch: It is growing. But then our market share in the UK is growing as well. At this point my recorder's rechargeable batteries packed in, so we decided to move on to Le Casa del Habano in Miramar, which was a revelation, with its very elegant interior, range of stock, squishy chairs, splendid bar, and welcoming ambiance. It's expertly run by Manuel Brinoles Lopez. "This is the best cigar shop in Cuba," said Mitch, who picked up a fine humidor, to take home. 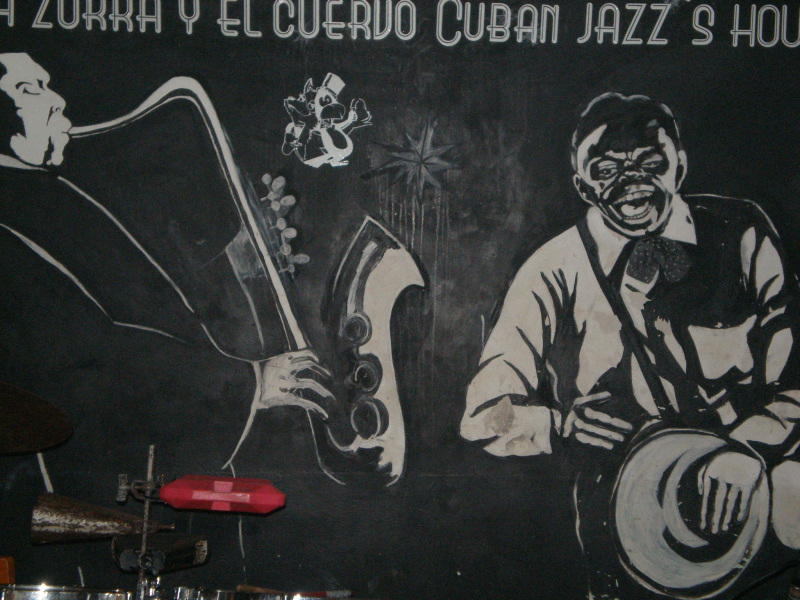 Wall images from La Zorra y el Cuervo jazz club in Havana Cigar-friendly painting on sale in Hotel Nacional de Cuba in Havana Is that a very large Havana or are you just pleased to see me? Eventually, we fell into the El Floridita where a large statue of Ernest Hemingway props up the bar. 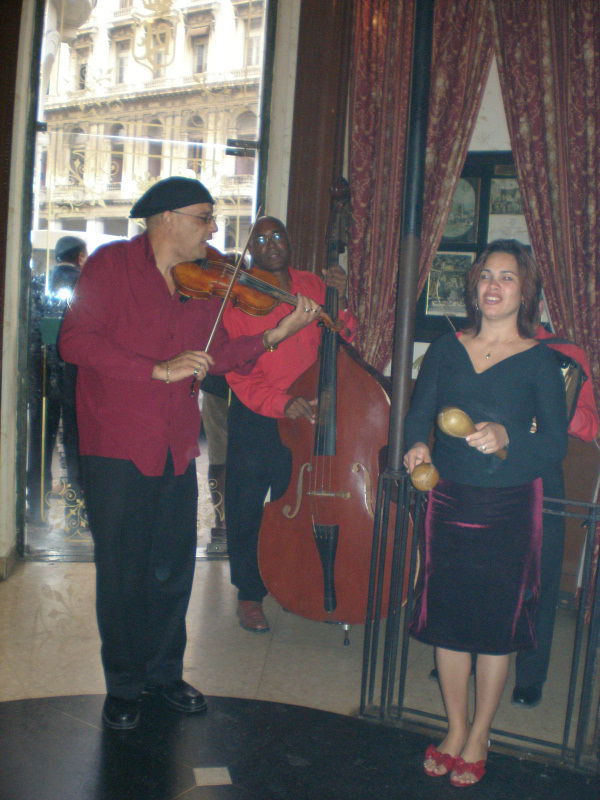 Clawing our way into seats at the polished bar so that we could be near the barman who was pouring out a steady stream of Cuban cocktails, we ignored the constant flow of tourists who kept coming in to take a photo and listen to the musicians - who were playing next to the entrance to attract new customers and entertain existing ones. 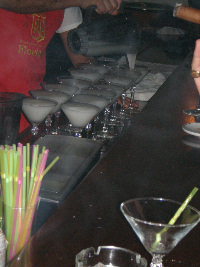 And sipped our way through half a dozen Daiquiris - easily the best I've ever had. After an hour or so we suddenly remembered we were due at the Partagas XIII anniversary dinner back at the Nacional, like ten minutes ago, and dashed back to change and make a belated entrance. 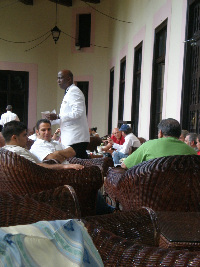 Not that any of our fellow diners noticed, they were too busy admiring the beautiful young Cuban women who were handing out mojitos. Having attended the annual Habanos Festival earlier in the year it seemed odd that the only two cigar retailers from the UK were present for the Partagas annual event: Mitch and Ajay Patel (of Havahavana.com, based in Teddington, London). Ajay had also been busy, seeking out the antiques that Mitch still hadn't bought. "The rest of the UK retailers are probably busy with the Christmas rush," said Mitch, "but they never come to the Partagas dinners. 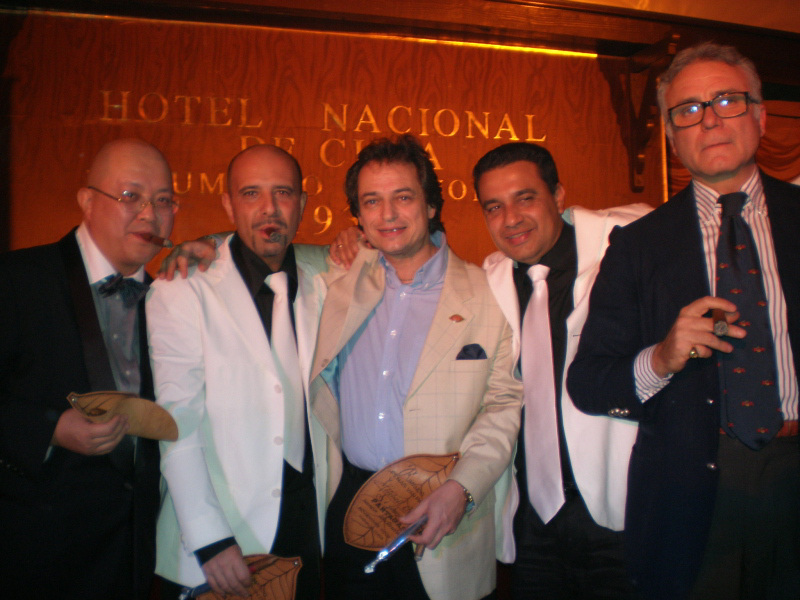 And they are really missing something special because this is a lot more personal and a real opportunity for some serious networking with cigar aficionados from all over the world. 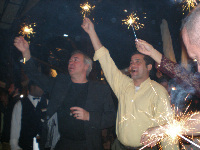 The Habanos Festival is great but sometimes it can be too much. 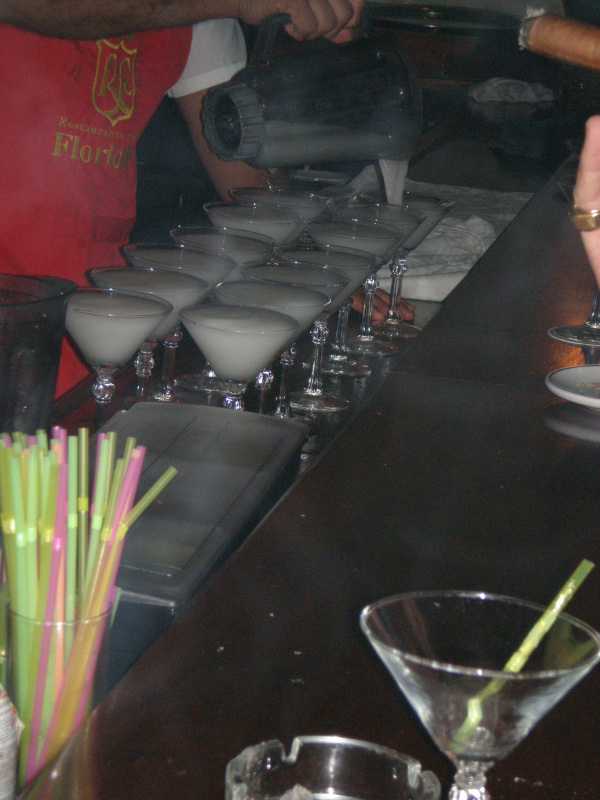 This is much more fun." We then bumped into Alejandro Robaina - Cuba's world famous cigar tobacco grower of Vegas Robaina brand fame - and mentioned to him the fact that we had met his old friend, Rodolpho, earlier that day. Robaina confirmed that he and his old friend often meet, "but to share news about the seed and the crops," he said, "not our techniques." 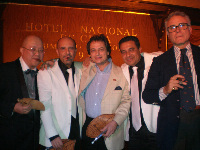 Afterwards we trooped into the Partagas dinner with about 400-500 other guests for a lively evening of music, cigars, networking and awards. 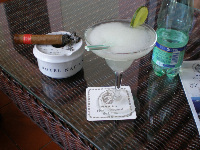 The food may have been so-so but the drink was better and the cigars were almost sublime (but still too fresh). Mitch had just settled down for a post-dinner cigar, one of many, when they called him up, three times, to accept a couple of awards and for the final award-winners group photograph. 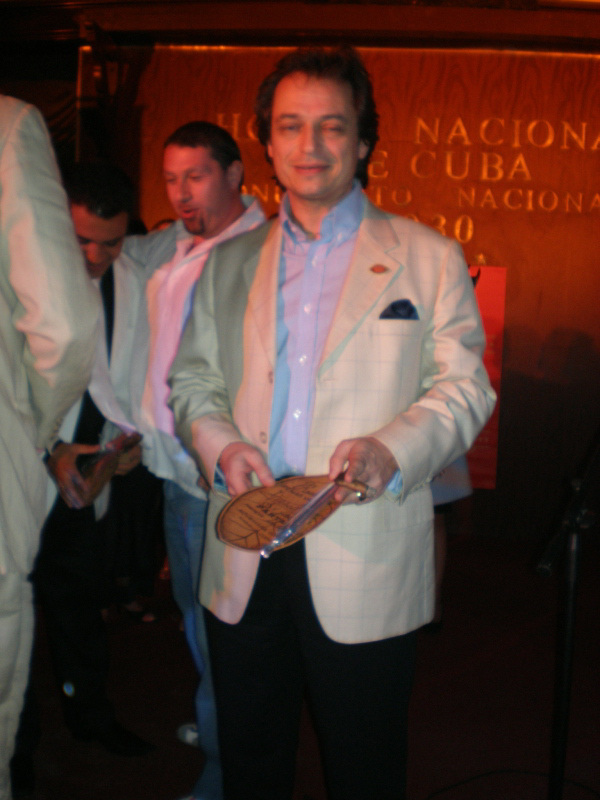 He was presented with a special Friend of Partagas Golden Leaf award, for his services to this world famous brand of Havana cigars. 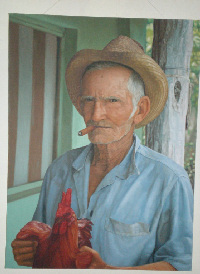 Certainly Mitch had earned it, as a man who has been flying the Cuban flag in Britain for years. At the rate his business is going, they'll be presenting him with an entire gilded tobacco plant, next year. Mitch with his Special Friend of Partagas gold leaf award - maybe one day he'll collect the whole plant! During the dinner, Mitch got a call on his mobile from his cab driver in Gatwick, who said he had just arrived to collect him from the airport. 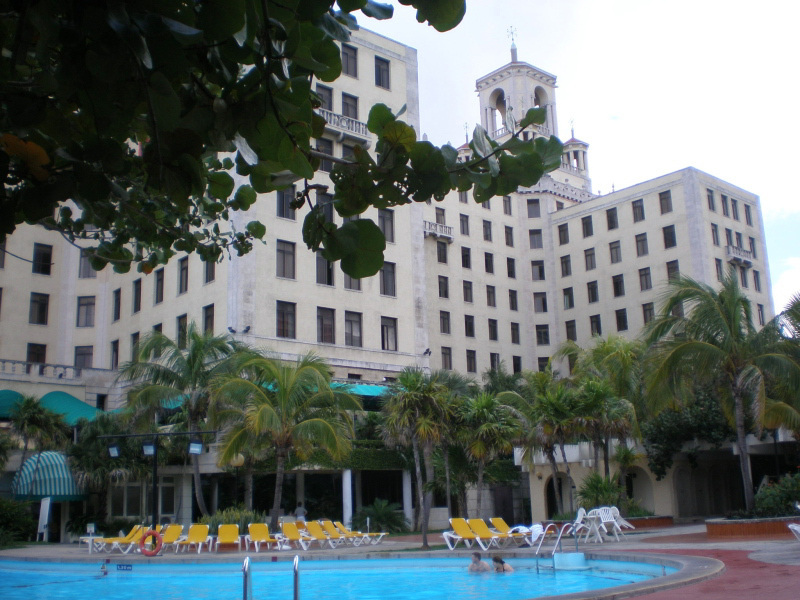 "I'm in Havana!" said Mitch. "Can you believe this!" After a moment Mitch calmed down and told the driver to make sure he was at the airport when he actually returned home, i.e. early Monday morning. "It's a long walk back to London with all the stuff I'm bringing home," he added. 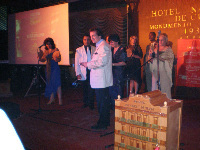 The second award was in recognition of Mitch finally realising his dream - to open his own La Casa del Habano, in Hamburg. And the rest of the evening was a blur but what I do remember is the dancing, the music, the girls and the cigars, but not necessarily in that order. How I got back to my hotel room in one piece, I'll never know. 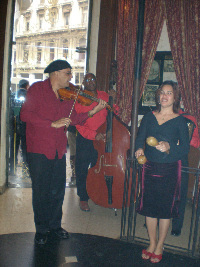 An hour or so later, we headed out for Mitchell's Canadian friend Amir's birthday dinner at a private restaurant somewhere in Havana. 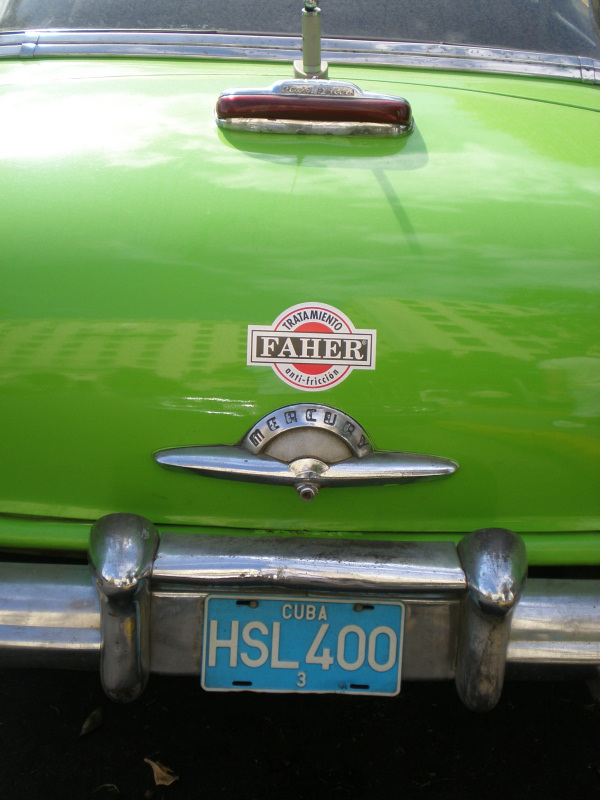 "It is difficult to find this house," said the Cuban driver. "There is no street name, no streetlights and no numbers on the houses." 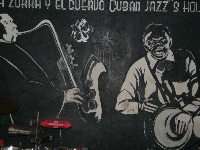 Eventually, we found a couple of elderly Cubans sitting outside in the dark listening to Cuban National Radio and smoking cigars. With their help ("past the dog, round the cat, back a bit and next to the dustbins") we found the house, which was full of Canadian cigar aficionados drinking rum and the local beer while salivating over the aroma of fresh roast suckling pig that had been prepared by the Cuban family. "Hang onto the driver or ask them to find someone who knows this place, Mitch," I said, "otherwise it's a good three double-coronas walk back to the hotel. That's if we ever find our way out of here." 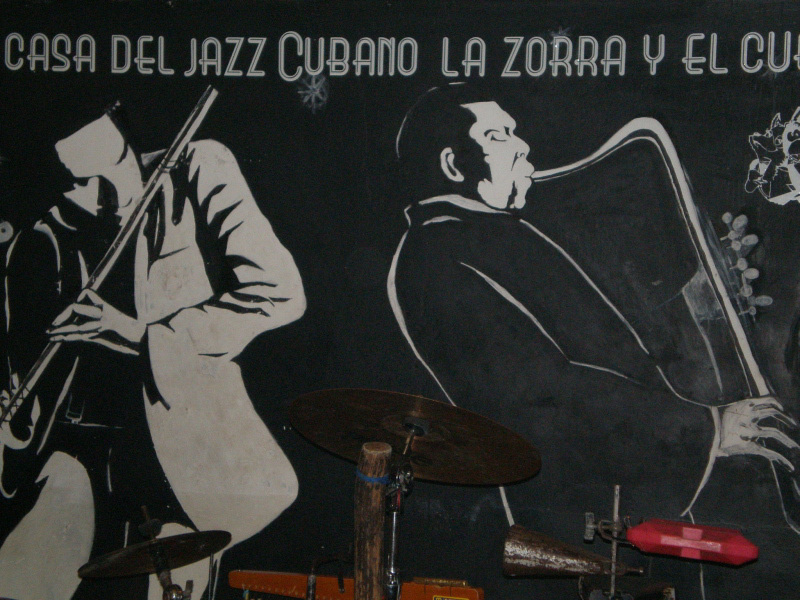 Fortunately, the next taxi driver knew the house and after dinner he collected us and dropped Mitch and I at the La Zorra y el Cuervo jazz club, about five minutes' walk down the road from the Nacional. Mitch and I enjoyed some late night Cuban jazz, especially the girl singer who had a remarkable talent, and decided to call it a day. It was well after midnight and we were smoked out. 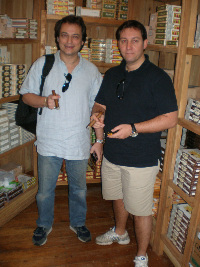 Later that Sunday morning, we made our last pilgrimage to the Partagas factory shop's VIP room. Then sat outside at the Nacional to end our trip with a final cigar and daiquiri. 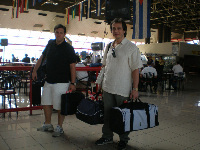 After four days in the company of Mitchell Orchant and Brian Ebbesen I was ready to head home for Christmas. 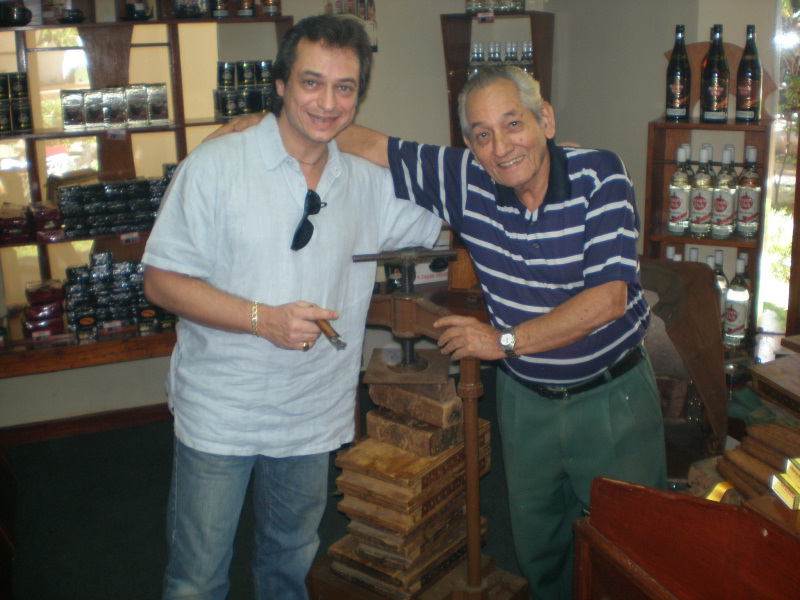 Mitch had got what he came for - a great selection of excellent Cuban-made humidors and some unusual antiques and photographs. And one or two nice cigars he wouldn't have been able to buy anywhere else. 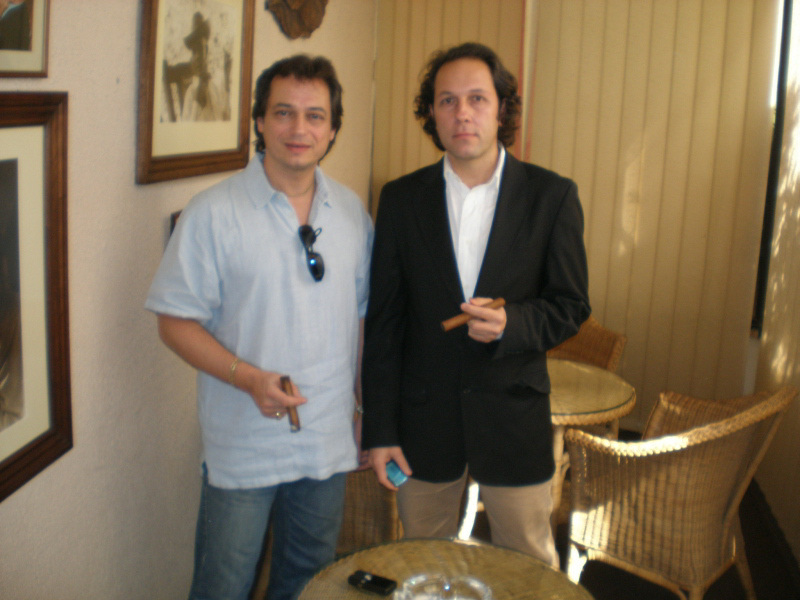 As for me, after all those drinks, meals and cigars that Mitch bought me, I reckon I should be writing a book about life with Britain's Mr Cigar. But not just yet. I'm still recovering.